I need to preface this post with a disclaimer. I'm not fan of turf. There's far too much lawn being mowed in the USA; it unnecessarily uses up water, gas, fertilizer, and time and creates nothing but poor water infiltration and extra pollution. However it's hard to argue against it for some areas, it's practically necessary in yards and parks where kids and pets play. But people love their lawns. So how do we create lawns that are a little more environmentally friendly? There's a few things we can collectively do, but homeowners, businesses, and landscape contractors need to get on board with these things. It benefits them all. While it's not the focus of this post, the biggest thing we can do to create more environmentally friendly "lawns" would be to use short grass prairie in place of turf in areas that aren't high traffic. This isn't a new concept by any means, and yet it hasn't gained traction. There are commercial buildings situated on acres of turf. Why can't prairie be planted in their place of these ecological dead zones? If a typical short grass prairie is still too tall for the site, there are certainly species that can be utilized that are shorter. Such mixes are already being used on green roofs. Admittedly the start-up cost of doing so is higher, but the long-term cost is much, much lower. In areas where turf is necessary, there are still ways to reduce water use and maintenance time involved. The first few are things that you should be doing with any turf here in the upper midwest. Mow at 2.5-3" minimum. That seems pretty high to most lawn lovers, but it's the ideal height for fescue-bluegrass blends. It will reduce water loss, reduce light penetration to weed seeds, and actually form a thicker turf. Keep your blade sharp, sharpen and balance at least once per year. A dull blade creates poor cut which results in more water loss. Stop fertilizing in summer, stop watering, stop bagging grass clippings! All of these are related. Cool-season grasses are meant to go dormant in summer. They don't need much water to stay alive, they will green up in fall when temps go back down and rain (usually) falls again. If the grass is dormant, it doesn't need fertilizer. And if you DO water and fertilize, you're just making it grow more so you need to cut more often. And if you do water and fertilize and then bag your clippings, you're just throwing that fertilizer right in the garbage. Grass clippings put nitrogen back into your soil. It also feeds the soil ecosystem which feeds the grass. Stop dethatching annually. Thatch is mulch. It reduces water loss, keeps soil cool which keeps the grass growing longer, and keeps the soil ecosystem healthy. Healthy soil equals healthy turf. Use only organic fertilizer. Again, healthy soil equals healthy turf. Milorganite and other organic lawn fertilizers do a great job feeding the lawn and the soil ecosystem. The best lawns I've seen are fertilized only with organic fertilizers. Fertilize only in spring and fall. Fall is the most important time for fertilizer. Spring is the second most important. Any other application is a waste of money. Seriously. All of the above will help you have a lower cost drought tolerant lawn. Here's a few things that most DON'T do that would go a long way to having better lawns. I don't mind, as I've said before it's dormant and will come up when we get some rain. Hopefully soon as things are far too dry, and even a lawn has no business looking like this in late September! But to get ready for selling our house, I removed my gardens and put in turf. Granted the soil prep I did for this area was done for gardens and not turf, but it has made a difference. (This post is when I put the gardens in in 2013). If you're doing your own lawn, plan on compost rather than just plain topsoil. Request proper prep from your contractors if you're not doing it yourself. It will cost a little more, but it's worth it. As you can see the area of tall fescue is much greener and more healthy. Though I do have a few bare spots that just haven't filled in properly, those have recently been overseeded. It was only fertilized last fall with a starter fertilizer. I have still had to mow this area though so it hasn't reduced my maintenance input. How can that be accomplished? There are several low mow or "no" mow options out there. They tend to all be good options for drought tolerance and having a lawn that looks decent. Prairie Nursery offers the original no-mow mix, which consists of 6 varieties of creeping fescue. It's drought tolerant and has good root depth which makes it pretty water thrifty. They say it reduces mowing to once or twice a year, but that's really dependent on the look you want. Certainly it will reduce your mowing almost regardless of how you want it to look as they tend to be slower growing. There are some low-mow forms of bluegrass out there. Some of the seed strains appear to be a little more prone to disease problems. Vegetative forms have been selected for good disease resistance. I worry about vegetative forms having a complete meltdown once they become prone to a disease. But these forms tend to only grow to 3" or so, making them almost no mow. High Country Gardens and a few other sources offer vegetatively propagated grasses in plugs. This is an expensive way to go, but the options are certainly intriguing. Blue Manna and Buffalo grass are both extremely drought tolerant and offer good options for less mowing. These are warm season grasses, meaning they'll look good in summer but green up slowly in spring and go dormant early in fall. As we hunt for our next house and our nursery location, we've already discussed installing low/no mow lawns. I'll definitely be trying a few options out when the time comes, and will probably even order a few flats of grass plugs to see how they do here in the far north and our sandy soil. Hopefully some of you will consider renovating your lawns or at least over-seeding with some slower growing or drought tolerant selections. I think for the average gardener shade gardens are tough to wrap their head around. They're not like sun gardens that have an abundance of blooms all spring, summer, and fall. A majority of well-known shade plants bloom only in spring. So shade gardens tend to bee seen as a study in contrast and texture with color as often coming from leaves as it does from flowers. This isn't to say you can't or won't have flower color all season long, but it takes a little extra effort to accomplish. Shade gardens seem to take a back seat especially in fall. I think there's so much emphasis from various media on mums and pumpkins that gardeners overlook the fact there are plenty of great fall-blooming plants for the shade garden. Staged correctly you can have almost as much color riot in fall as you can in spring. And you get a diversity of foliage color and texture too! We carry many of these at Botanophilia, and you can find them here. 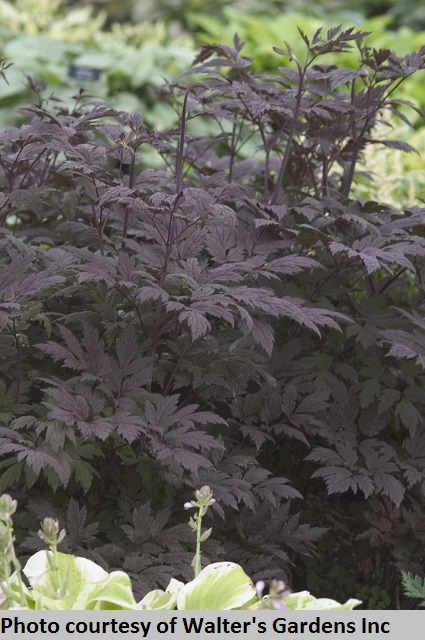 This great plant is represented in gardens primarily by its many dark-leafed forms, 'Hillside Black Beauty' and 'Black Negligee' are probably the most popular. The former has the darkest foliage on the market, the latter is much more vigorous and still has nice dark color. Foliage is coarsely divided and reaches 2-3' tall. 12" spikes of white, sometimes tinged pink, fragrant flowers to 6-7' tall in August and September often lasting into October. Easily reaching 7' across in time, this plant takes up some real estate but is a magnificent accent plant. Former classified in the genus Cimicifuga, in 2000 it was reclassified using morphology and DNA data and placed in Actaea. 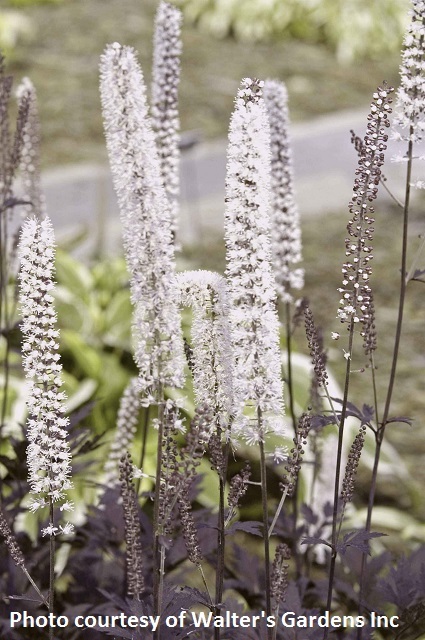 Also often listed as Actaea or Cimicifuga ramosa, but there is no valid species by that name. Ramosa was published in an obscure reference 1932. Any plants listed as such most likely belong to A. simplex which is native to Russia, China, Korea and Japan. 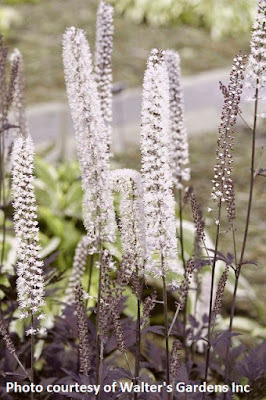 There IS however Actaea racemosa native to the US, but (as far as I know anyway) there are no dark leafed forms of that species. The similarity between the invalid ramose and racemosa often leads to confusion as well. The group of fall blooming Anemones come in a range of colors from white through vibrant dark pink and may be single or double flowered. They range in size from 14" to 4' tall depending on variety. The only down side to this plant is that it can be pretty aggressive, so it can be tough to mix with other plants. But as a large scale groundcover it can work very well and give a huge amount of color in the fall. Some hybrids may be less aggressive than others as well. White turtlehead is a great US native that forms a 4' tall x 3' wide patch of dark green foliage topped with white flowers in late summer to fall. Apparently it can reach nearly 6' tall in optimum conditions.As a general rule Chelone glabra prefers moist conditions as it's found bordering wetlands but I've had good luck with it in average conditions if it doesn't get too dry. It's also the larval host for the Baltimore checkerspot butterfly. 'Black Ace' emerges with dark, almost black, stems and foliage that gives way quickly to dark green. Similar in look to white turtlehead but with broader foliage and rich pink flowers. This species has a bit more of a spreading habit as well, reaching 5-6' wide in time. Foliage is clean, glossy, and dark green. 'Hot Lips' is the typically encountered form of the species, but there are a few other varieties. Some are reputedly quite compact but that so far hasn't been the case in my gardens. This might be one of my favorite under-rated fall bloomers for shade. Formerly classified in the genus Aster, it was moved to Eurybia when the American Asters were reclassified. 'Eastern Star' is a nice compact form that stays 18" or less for me. White flowers in September are small and unassuming individually but make a great show when viewed en masse. 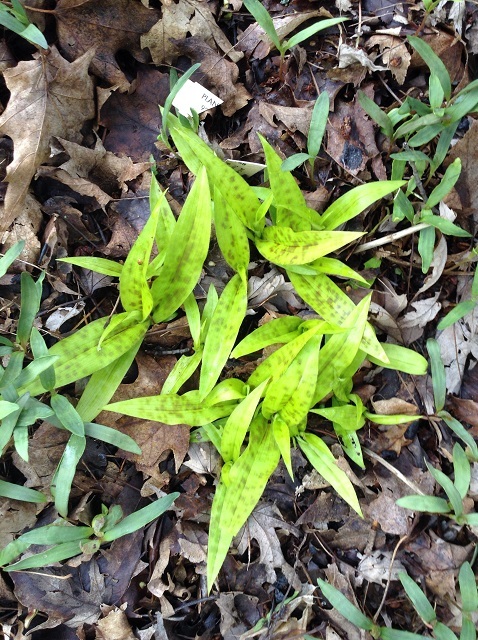 Arrow-shaped foliage is dark green and held on dark wiry stems. After flowering you can get excellent fall color ranging from yellow to bright red. Geraniums are typically thought of as spring bloomers but there are a few species that bloom in fall. G. soboliferum is one of those and 'Butterfly Kisses' is a selection from Brent Horvath with bright pink flowers. Foliage is finely cut like many other species and fall color can be a good bright red, habit is mounded and clump forming to 18" x 24". I have had it seed around a bit but I wouldn't call it invasive. I love this plant as a textural contrast to hosta. Kirengeshoma has become one of my favorite background plants for shade gardens. Broad palmate foliage on typically upright stems topped with waxy, bell-shaped, yellow flowers in August to October. Growing 4-6' tall and equally as wide. 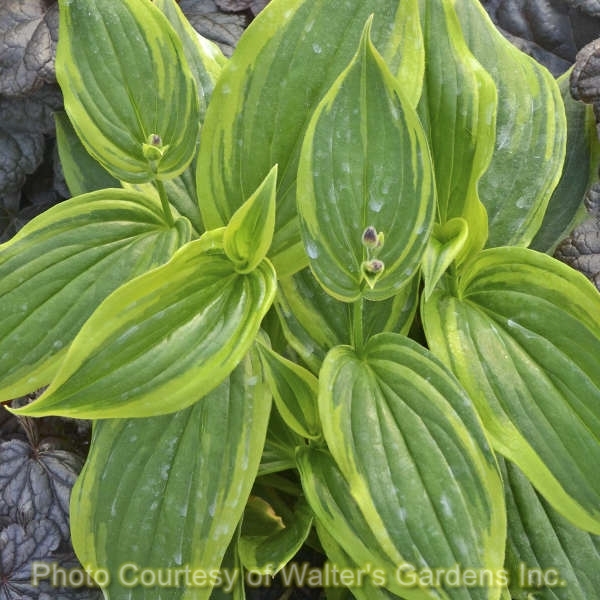 This is a great backer for hostas, grasses, and ferns in shade gardens. Japanese mountain mint is a neat plant that's starting to gain a little more popularity. It's one of the well-behaved plants in the mint family. 'Gold Angel' has bright yellow foliage and forms a nice clump 3-4' tall x 3' wide. 'Silver Angel' has silver foliage, is a little bit rhizomatous, and grows 18-24" tall x 3-4' wide. 'Mountain Madness' has randomly variegated foliage and a similar habit to 'Gold Angel'. Flowers are short spikes of lavender flowers very late in the season, October here in Wisconsin. 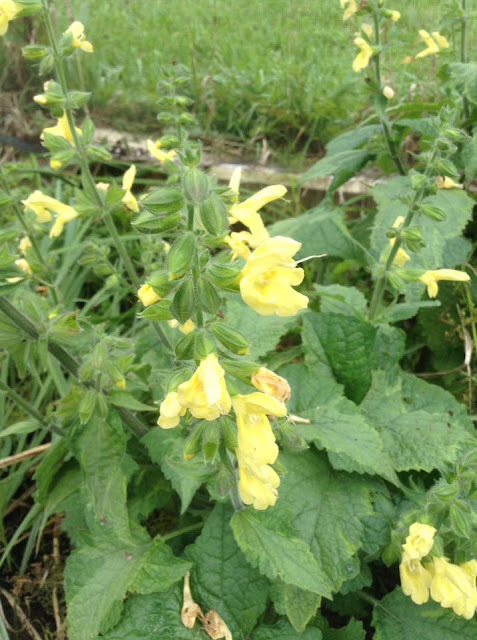 Salvia is usually thought of as plants for dry sunny gardens but there are several species that are found in woodland habitats. Salvia koyamae has broad fuzzy foliage mounded 2-3' tall x 3-4' wide topped with light yellow flowers in August through September. 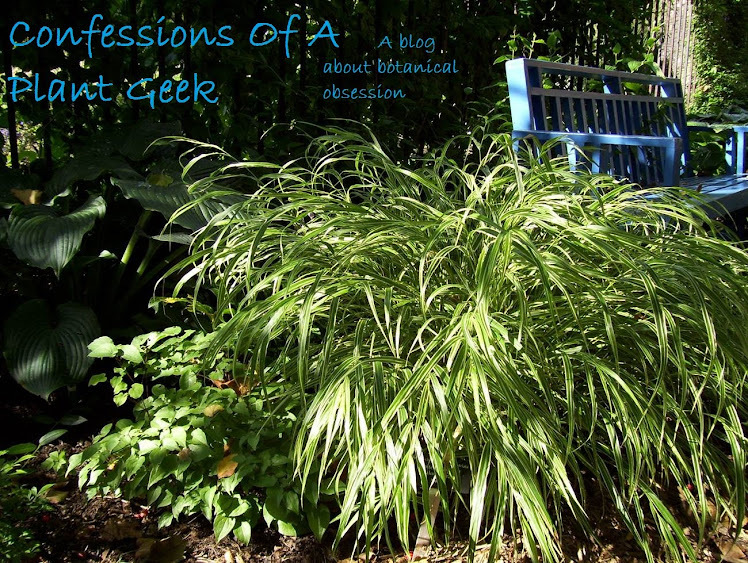 For me it's fast growing and is a great background for ferns with Hakonechloa and Heuchera for color and texture contrast. Another favorite very under-rated shade plant, goldenrod in general needs to be utilized more and this one absolutely should be used in shade gardens. It's well-behaved forming a 4'-5' wide colony in 10 years for me. Foliage is randomly splashed with bright gold. Flowering at 3-4' tall in August to late September. Great for pollinators and generally problem free. This makes a wonderful background to medium and large hostas. 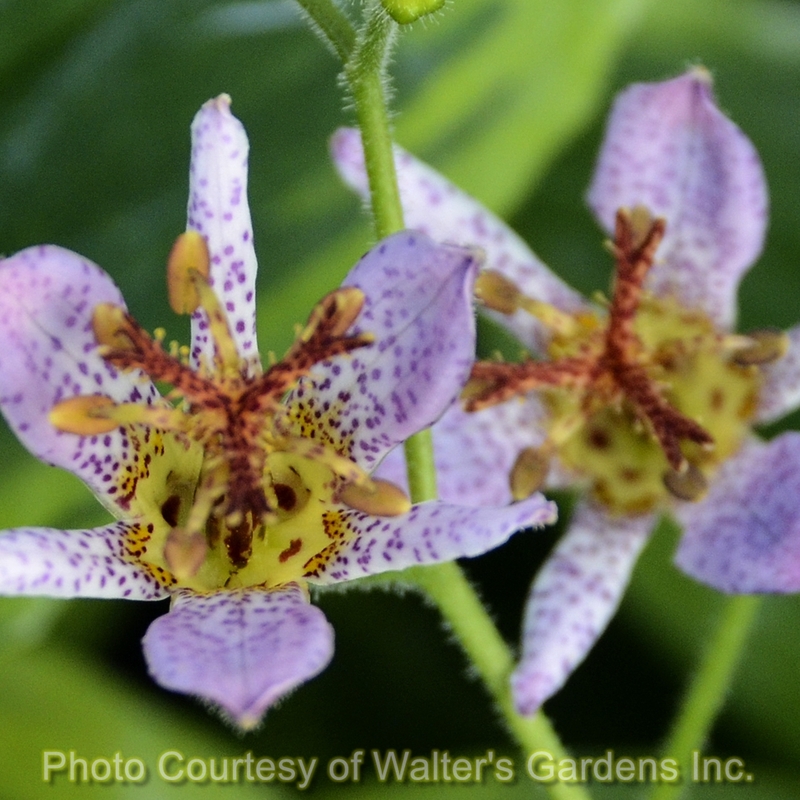 Toad lily has been fairly popular over the years and there are many great forms available for gardeners. Flowers are typically white or yellow with purple spotting blooming in fall, though there are some that bloom in summer. For the most part form is upright, though there are some types with an arching habit. Baptisia is a genus in Fabaceae, which is the same family as peas and peanuts, making it a legume. There are around 30 species and subspecies found throughout North America. Most are found in grasslands, savannahs, and woodland edges. Many species are interfertile and natural hybrids have been found in the wild. One of the reasons false indigo has become so popular is that they tend to be easy to grow and adaptable. As long as they aren't too wet, most will grow fine in heavy soil. They are also very drought tolerant and perform great in sandy soils. Full sun is best, but most will tolerate light shade. I've been growing different forms of Baptisia almost as long as I've worked in the horticulture industry, and I've watched their popularity grow over time. That popularity really started to take off in 2010 when B. australis was selected as the PPA Plant of the Year. Now there are A LOT of Baptisia varieties on the market. None of them are bad, though certainly some are better than others. I'll go through all of the ones I've managed to get pictures of over the years. This has long been my favorite species in the genus. It tends to be sturdy, the clean white flowers are held above the foliage on long spikes, and its long stems form a vase-shaped habit. The habit of it being bare at the base allows for good air circulation to lower plants around it. This species has been used in some of the hybrids, passing on traits like long flower spikes and vase-shaped habit. A form of Baptisia alba with shorter flowers and tall habit. This was actually purchased as B. sphaerocarpa, but when it flowered a few years later with white flowers, I knew the real identity. This is by far the most widely planted species. It has great bluish purple flowers on spikes held just above the foliage. My only complaint about this one is that it is widely seed grown, resulting in inconsistent performance. Plants may be dense and sturdy or they may be loose and floppy. Sadly, there's no good way to know for sure when selecting young plants. 'Big Ben' was selected for its larger flowers and larger habit. I really like this one, but unfortunately it has always been a little lax in my garden, require staking later in the season. A form of B. australis w/ gold foliage. Hybrid false indigo started entering the market in the late 1990's with the introduction of 'Purple Smoke' from NC Botanic Garden. It was followed by 'Carolina Moonlight' in 2002, a hybrid of B. sphaerocarpa and B. alba also from NCBG. These were breakthrough plants as they showed much more vigor and better habit than B. australis. A classic and vigorous hybrid between B. australis and B. alba discovered in fields of seed stock of B. australis. Smoky purple blooms on long spikes held above the foliage and an upright habit. Jim Ault from Chicago Botanic Garden started hybridizing Baptisia in the late '90s. Jim has used a good range of species in his program, including B. alba, B. australis, B. australis var. minor, B. bracteata, B. bracteata var. leucophea, B. Sphaerocarpa, and B. tinctoria. What I've noticed is that he tends to select full bushy plants with not much open space at the base. Though some are certainly more upright than others. 'Twilite', 'Starlite', 'Solar Flare', 'Midnight', and 'Lunar Eclipse' are available. 'Royal Purple' will be available in 2018. Several others haven't hit the market yet. This hybrid of B. australis and B. sphaerocarpa was the first plant selected for marketing out of Jim's program. It's a monster at nearly 5' tall x 6'+ wide. Flowers are a dark dusky purple on long stems at the top of the foliage. This one is vigorous. Mine was 4'x4' by the third year. The second plant out of the program at Chicago Botanic Garden, a hybrid of B. australis x B. bracteata. This one is also fairly large and vigorous, but slower than 'Twilite'. Expect it to reach 3'x5' with a somewhat arching, but not lax, habit. Flowers are lavender with buttercream keels. 'Blue Mound' is a hybrid B. australis var. minor and B. australis var. australis from Chicago Botanic Garden. The habit is very much like minor: low, broad, and bushy; but it's a bit larger and has larger flower spikes like australis. This multi-generational hybrid between B. australis and B. bracteata var. leucophea has buds that start out bright pink and age to rose-lavender. Habit is quite a bit like a good form of B. australis. From Chicago Botanic Garden. A complex hybrid developed from the species Baptisia australis, B. bracteata var. leucophaea, and B. sphaerocarpa. Habit is much like australis, but the flowers are very dark purple. A second-generation B. australis x B. bracteata var. leucophaea hybrid, 'Sandstorm' is another variety with uniquely colored blooms. Sand colored flowers on long spikes held above the foliage in tremendous profusion. A Baptisia australis x leucophaea selection backcrossed to B. leucophaea. I like the thought of this plant: maintaining the unique low habit of B. leucophea but with better vigor and easier to propagate. But the habit appears quite floppy. Possibly worth pursuing this goal but using another plant with better habit, B. australis var. minor maybe. I'm not sure if we'll see this one on the market. A hybrid of Baptisia sphaerocarpa crossed with Baptisia alba, this one displays numerous long yellow flower spikes. Habit is more bushy than other similar hybrids on the market. 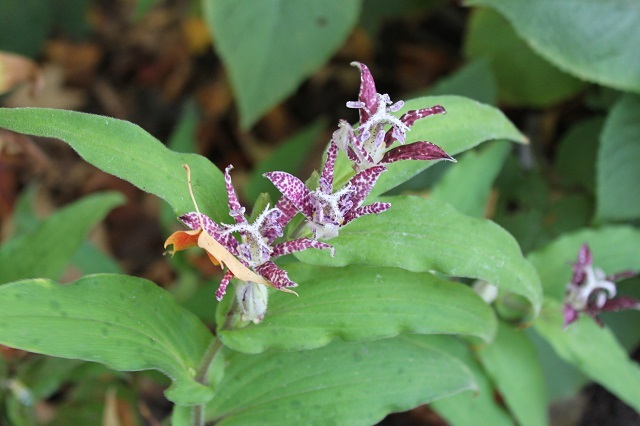 Tony Avent from Plant Delights Nursery in NC has long had an interest in the genus. They have sold a large number of species selections over the last few decades and have lately been introducing hybrids from their program. This is a hybrid betweeen B. sphaerocarpa and B. alba. 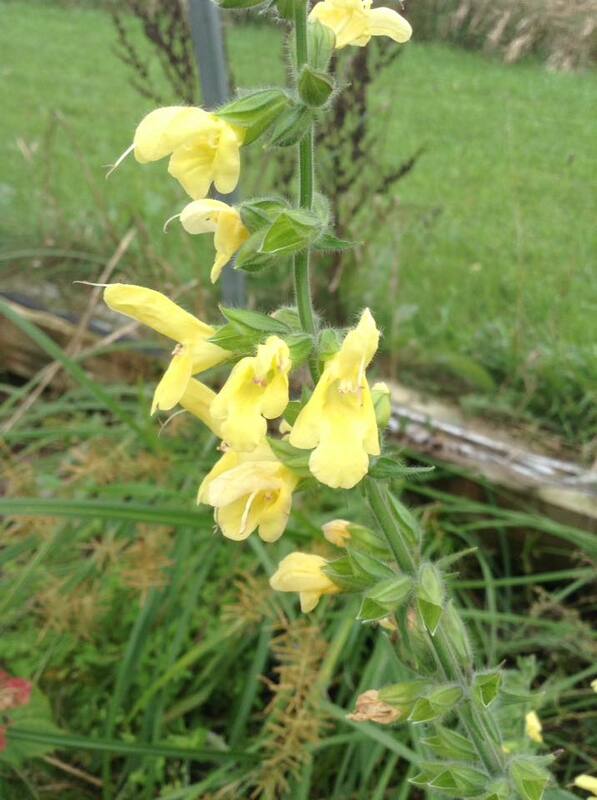 It has long flower spikes and upright habit and bright yellow flowers. Flower coverage is excellent. This variety is a hybrid between B. australis and B. alba. It retains the flower color of australis but has the habit of alba. It's comparable to 'Purple Smoke' but with a more clear flower color. The vast majority of new Baptisia on the market are bred by Hans Hansen. Hans started his hybridizing program in the 90s in MN and moved it to MI when he went to work for Walter's Gardens. He has utilized a wide range of species resulting in some unique flower colors. Many of his plants have been introduced through the Proven Winners program. This hybrid between B. sphaerocarpa and B. australis var. minor has reddish flowers with a yellow keel. Habit is upright with flowers held just above the foliage. This is one of his first hybrids to become widely available. This hybrid between B. sphaerocarpa and B. australis var. minor has flowers the color of dark chocolate. This is from the same cross as 'Cherries Jubilee'. Habit is more bushy and flowers are held just above the foliage. This is a nice plant up close, but the flowers are so dark they are lost from a distance. This is one of the more unique varieties of Baptisia, having chocolate brown flowers on upright stems and an upright habit. Brown flowers may sound a bit odd, but it's really quite pretty. Before dismissing it, think of all the great color combinations that can be done! Like 'Blue Mound', this is a hybrid between minor and australis. The habit is quite a bit more upright, larger, and it blooms slightly later. A hybrid between B. sphaerocarpa and B. alba. Long lemon-yellow flower spikes and upright habit. This variety resulted from open pollinated seed from a trial bed of many species. Cream-colored spikes are held just above the foliage. Roy Klehm, owner of Klehm's Songsparrow Farms, has recently introduced a few Baptisia to the market. I'm not sure of their origin, but I expect they are from open pollinated seedlings of various hybrids. This variety is from Roy Klehm and appears to be a hybrid of unkown parentage. 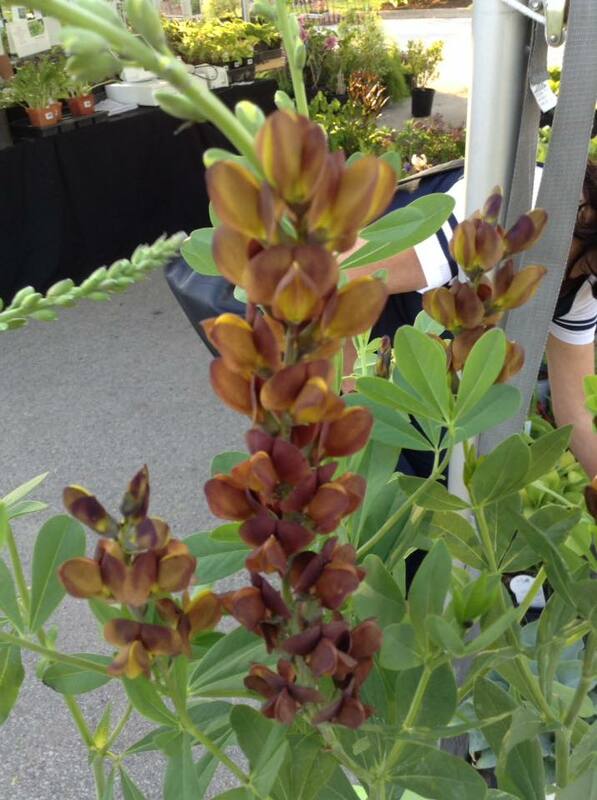 Flower buds are dark cinnamon colored opening to "toast" colored flowers. It's really much prettier than it sounds. A yellow hybrid of unknown origin. A dense mound with flowers just above the foliage. Good flower production, but somewhat short spikes. Should reach 4'x4'. Baptisia has been part of my gardening and professional life so long that it's hard to imagine gardening without them. I've thought about hybridizing with them, and may do so some day, but there are so many good ones on the market now that I'm not sure it's necessary. I do have one selection I may introduce. It's an open pollinated seedling of 'Purple Smoke' with the same smokey coloration over a lavender-pink flower rather than lavender-purple.